UNIVERSITY PARK (AP) – At some point over the past five months, potential recruits stopped asking Penn State coach Guy Gadowsky when the fledgling program would be competitive at the Division I level. He doesn’t know exactly when the questions stopped, but any shred of doubt was erased this week on the ice. In the season finale, at Wisconsin, a 3-2 overtime win over the 16th-ranked Badgers signaled that Gadowsky’s bunch will be ready to go skate-to-skate when the puck drops on the new Big Ten hockey league next year. “Obviously, Wisconsin was a tremendous win for us,” Gadowsky said Thursday, “and I don’t think we’ll be getting that question anymore. Penn State had one of the nation’s top club programs before energy company executive Terry Pegula made a donation in 2010 to upgrade the men’s program and build a new ice arena. The gift, which eventually grew to $102 million, was the largest private gift in school history. The school also elevated the successful women’s club program to Division I status. Both teams will play at the new Pegula Ice Arena, which is scheduled to open Oct. 11 against Army. The Wisconsin win added more positive buzz for a team that showed improvement as the 2012-13 season progressed. 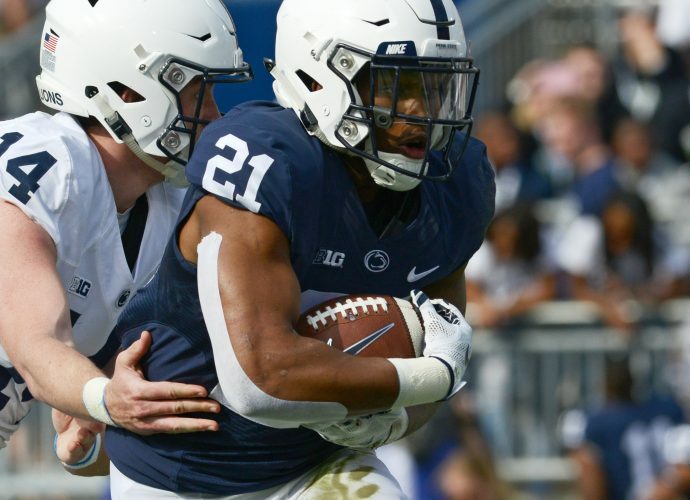 Penn State opened the season with a loss to American International. They also lost to Division III Buffalo State and the Arizona State club squad. Penn State finished 13-14, including a 3-2 mark against future Big Ten opponents. The Nittany Lions beat Ohio State at the Three Rivers Classic in Pittsburgh, while splitting two-game series against Michigan State and the Badgers. Junior forward Taylor Holstrom netted the game-winning goals in each win over the future Big Ten foes.